One of the ultraviolet images obtained during the data acquisition frenzy turned out to be the millionth image taken by the Neil Gehrels Swift Observatory—an event celebrated by NASA, which operates this space mission. 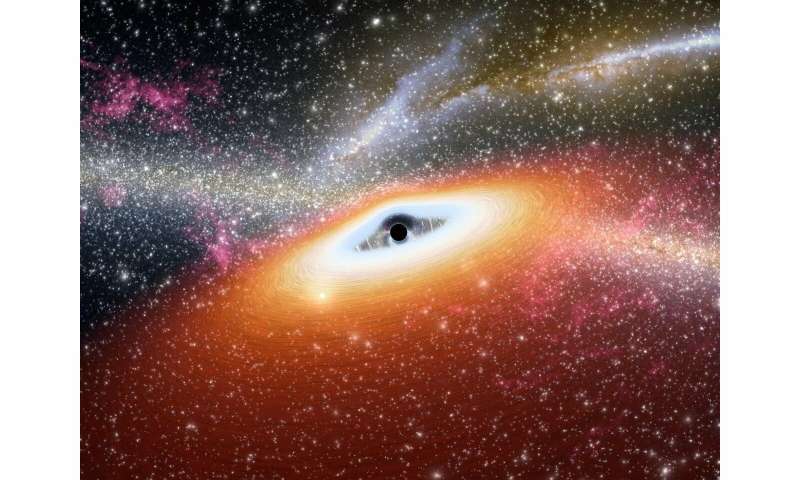 "Team discovers new way supermassive black holes are 'fed'." "We are not yet sure about the cause of this dramatic and sudden enhancement in the black holes' feeding rate," concludes Dr. Trakhtenbrot. Is physorg only interested in eyeballs and not the minds behind them? If they found out anything, it looks like they want to keep it secret. TBF, dsylvan, if you highlight that headline, and paste it into Google, you'll find that it pops up on a number of sites. Remember, this is just a science news aggregate, and there are plenty of others, and they just take their stuff from PRs from various institutions. Many of the people doing the PRs for those institutions may not be well versed in the relevant science. ...Remember, this is just a science news aggregate, and there are plenty of others, and they just take their stuff from PRs from various institutions. Many of the people doing the PRs for those institutions may not be well versed in the relevant science. I am sure it is frustrating to them too, but as it happens it is not a click bait title (much) since they did discover a new mode. Welcome to science, progress through frustration, no easy pre-digested media talking points. That joke - if it is one - does not work since scientists cannot keep stuff secret (except between publications), they live on *revealing* "nature's secrets". john, you shouldn't waste your energy in fear of the MIB. However, you do seem to have good reason to concern yourself with the threat from the MIW. I would suggest you get a shoovel & start digging a very deep hole to hide in. I promise. pinky-swear. I'll send you a singing telegram when you can stop digging. ...scientists cannot keep stuff secret (except between publications), they live on *revealing* "nature's secrets". You are not a scientist, and you'll never publish in a respectable journal. Ergo, your inane rantings are just that. I'm very glad you included that rider "except between publication" in parentheses, mate. Because when I pointed out to some here that I was perforce keeping some things secret until I am ready to publish my work 'complete' instead of 'piecemeal', they were uncomprehending of that obvious scientific-publication-imperative of 'intervening secrecy', especially when novel/original/complex work is involved. Thanks for making that clear for those who were less than polite when I previously informed them of that very same 'secrecy imperative' that you just confirmed was normal practice for mainstream science work/publication. If I get any future hassles from anyone regarding that 'secrecy' score, I shall refer them to your post instead of arguing with them. Thanks again for your correct understanding/support on that score, mate. Envy. Malice. Denial. You have no idea, jd. Stop it.